The Federation of Historical Bottle Collectors (FOHBC) cordially invites your club to join a dedicated group of individuals and clubs who collect, study and display the treasured glass and ceramic gems of yesteryear. The Federation of Historical Bottle Collectors is a non-profit organization supporting collectors of historical bottles, flasks, jars, and related items. The goal of the FOHBC is to promote the collection, study, preservation and display of historical bottles and related artifacts and to share this information with other collectors and individuals. Federation membership is open to any individual or club interested in the enjoyment and study of antique bottles. The Federation publication, BOTTLES and EXTRAS, is well known throughout the hobby world as the leading publication for those interested in bottles and “go-withs”. 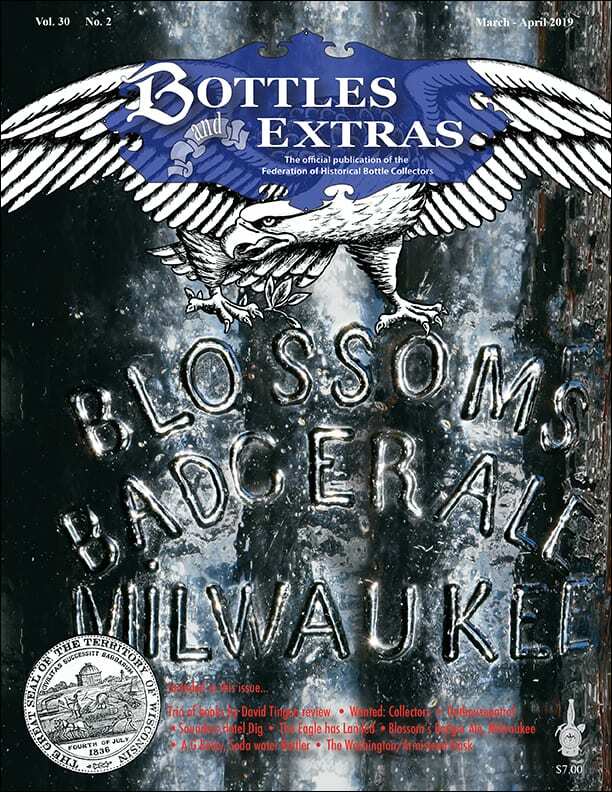 The magazine includes articles of historical interest, stories chronicling the hobby and the history of bottle collecting, digging stories, regional news, show reports, advertisements, show listings, and an auction directory. BOTTLES and EXTRAS is truly the place to go when information is needed about this popular and growing hobby. Insurance: All FOHBC Affiliated Member Clubs are automatically included (at no additional cost), in the Federation’s Group General Liability Insurance Plan. This policy is designed to provide liability insurance coverage for the Affiliated Club’s annual show(s) and other club sponsored activities. Example: A club chair or his or her designee contacts Elizabeth Meyer (FOHBC Business Manager) and she will then send a request form to the club. Do not contact the insurance company directly. After completing, the form is sent back to Sheldon Baugh with a copy to Elizabeth Meyer. This is all done electronically. The form will then be sent to the insurance company. The FOHBC will then supply a certificate for the club and facility that the show is at. Please allow a month or so to process. Advertising: A 50% reduction in display advertising (see chart at bottom of post) in the magazine and the newsletter. In addition to this, free posting of the ad on the Federation website (www.fohbc.org) as a part of the advertising package when you advertise your show in the magazine. Links: The Federation will post links from our website into your clubs website free of charge and will assist with creation of a web page for you, as our webmasters time allows. You supply the photos and general text and we will do our best to get you up and running! 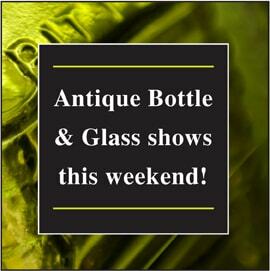 A National Antique Bottle Show in one of our four United States regions each year. A National Convention (expanded Expo format) every year (starting in 2016) in one of our four United States regions. Access to the informational FOHBC Slide Show Presentations. Each year, the Federation elects members to the Honor Roll and Hall of Fame to recognize their individual contribution to the hobby of bottle collecting. Our clubs are encouraged to sponsor individuals for these honors. The Federation sponsors annual writing contests for individuals belonging to member clubs as a means to recognize their outstanding contributions. Contests for club newsletter design and show flyer design. We need your support! Our continued existence is dependent upon your participation as well as expanding our membership. The Federation is the only national organization devoted to the enjoyment, study, preservation, collection, and display of historical bottles. 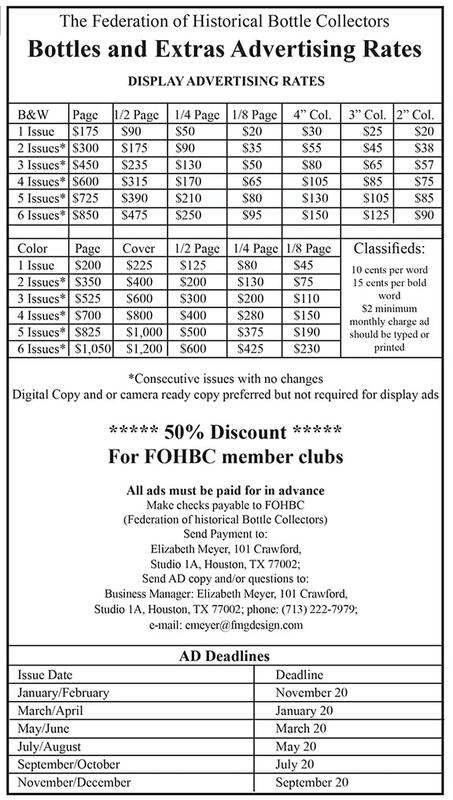 The FOHBC welcomes individuals who would like to contribute by running for Board positions or by sharing their expertise and volunteering their talents in other areas of interest such as contributions to our publications, assistance with the Federation’s National and EXPO shows, or through membership promotion. If you haven’t yet joined our organization, please do so and begin reaping the benefits. If you are already a member, please encourage your friends and fellow collectors to JOIN US!! Need more Membership information? Just send E-mail to our Business Manager and they will be more than happy to send you an information packet via regular mail. No risk, no obligation. Please be sure to include a mailing address in your E-mail, as well as the fact that you’d like information about the Federation of Historical Bottle Collectors. Club membership runs from July 1 to June 30. 1) Fill out the following form (see below) and pay the $75 via PayPal. You will be redirected to that page after you complete the form. I certify that our club has at least ten members, meets at least quarterly, has open minutes and a treasurer’s report and is a not-for-profit organization. Payment options through PayPal are available after the form has been submitted.